Betty Fans have been asking for a Hummingbird update. To tell you the truth, I have been putting it off, but today I release the news. --to this on April 25th. One hatchling, but the other egg did not hatch. That's the bad news. 4/29 At last! I saw the hatching move! Hurrah! I did a little jig around the house! So, even though one egg did not hatch, we have reason to hope for this little guy. Betty's been waxing philosophical these days, thinking about life in general. 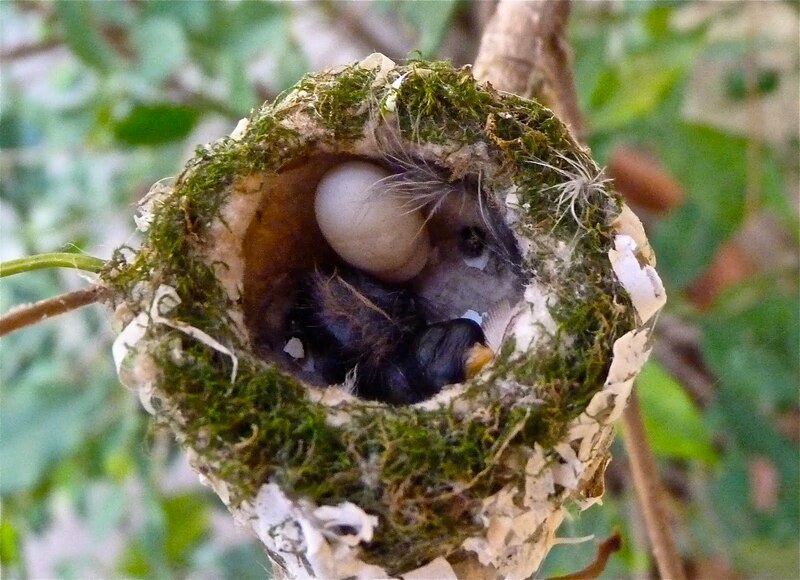 This nest pretty much sums it all up. There is sorrow and and there is joy. They sit side by side in this life, in this complicated nest we have woven for ourselves. We can't avoid the sorrow and we can't help but celebrate the joy. Here's hoping your joy grows and grows, giving you wings to fly into the wide, open sky. Betty- Beautifully said!! Beautifully photographed!! Beautiful philosophy!! Yay! I'm so glad it is thriving! 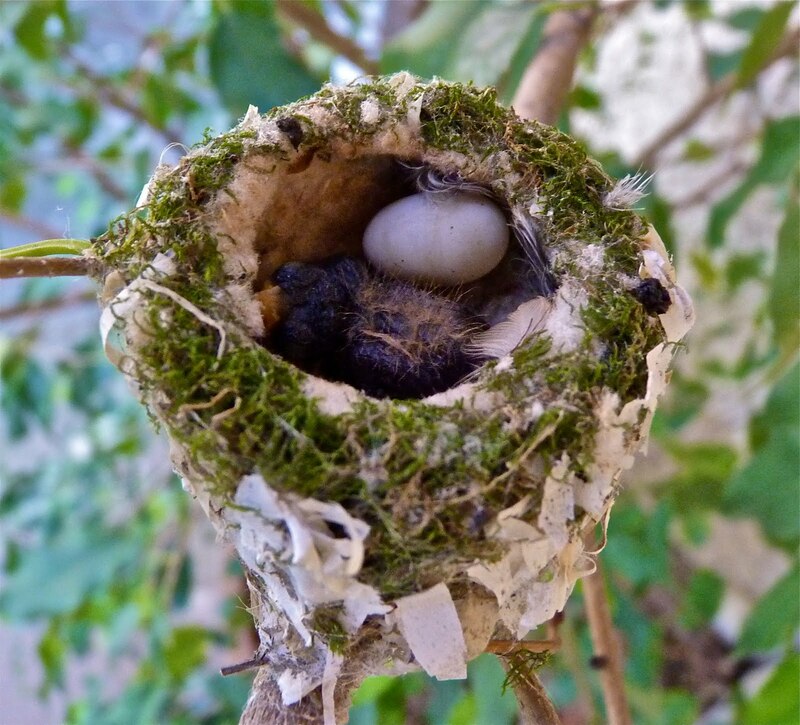 Thanks for the update on the hummingbird nest. Betty your post are so thought provoking and inspirational....thank you! You are so right life is short we cannot dwell on the negative we have to take each day as the gift it was meant to be. I gotta develop the skill of "let it be." This is very cool, and you are lucky to have that nest in such a convenient place. Keep us updated! 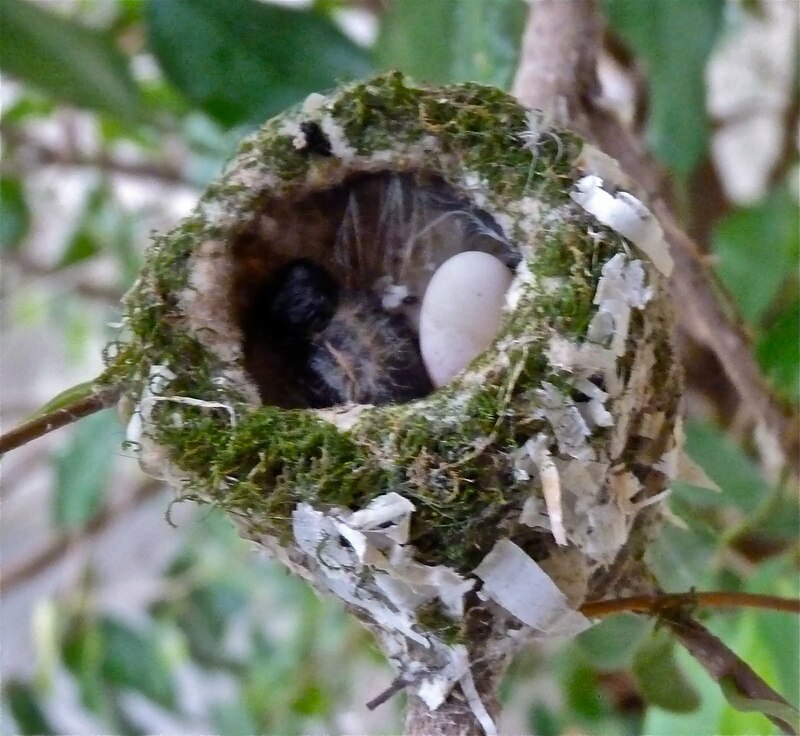 Looking forward to more updates - wonderful photos of the nest again. SOOO perfect and so well put,Betty. It's almost as if the bird Gods knew that you needed these little moments of joy and sorry, huh? So amazing how life works like that. THanks so much for the update, Betty. I've been anxiously awaiting to hear about it! Thank you for sharing these amazing pics! 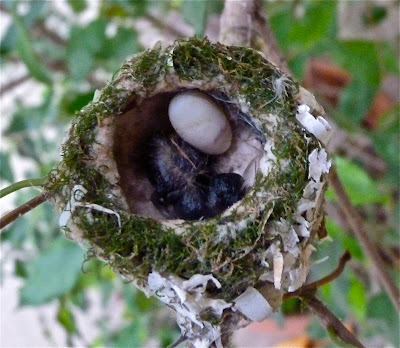 Hummingbirds are so so tiny this must be an itty bitty nest with ittier and bittier eggs! It is so sad isn't it that only one hatched but what a brave little hatchling!! I've got everything crossed that he or she will survive!!!! Please grow bigger and stronger, little birdie! Isn't it amazing how things like this can eerily mirror our own lives? I'm rooting for the birdie (and for you). Awww!!! How wonderful!! This is the first time I've ever seen a hummingbird nest, much less a baby hummingbird....thanks!!! This is fantastic! So glad the little guy is doing well! And beautiful post Betty, once again! Your outlook is inspiring and the analogies... perfect! I so absolutely love that you showed this! We are huge bird lovers here. I am anxiously awaiting the arrival of our little hummingbirds to the area again. The feeder is out and waiting! My boys would be dying with excitement if this was in our backyard. Oh no... You had me so nervous! I am glad things are going to be ok with that one little one... or so we hope! 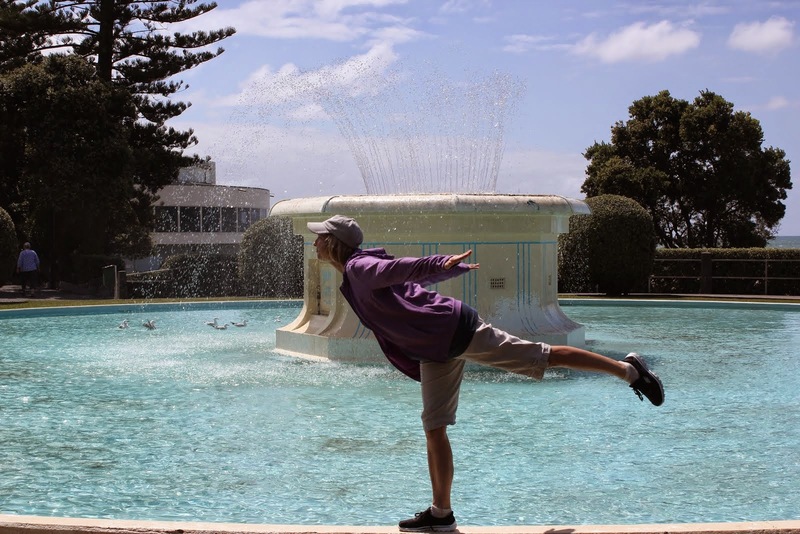 I absolutely love your photos and your philosophic waxing about the juxtaposition of sorrow and joy. How true and how wonderful that you were able to capture it in nature. Brilliant betty we c=should cal you!! What fun that must have been to watch!! Great photos! Right outside your window? I'm back after a while again- i loved your post! I applaud your courage for having gone so close. I would have feared scaring the mum-bird. Beautiful pictures. Yay for the movement! Yay, yay, yay! Wow Betty! You have such a way with words! I love the post...and the pics! I did read the post....and no divorce papers kiddo. You are stuck with this follower. Left you a message on that post. Have a great week-end!!! I love you BB but you have got to stop making me cry! Amazing. Guess you chickened out on making the omelette, huh? That was a very beautiful thought that you had! :) I love it. Thanks Betty. It all comes full circle. Be well, and I'm glad you will not consider plastic surgery. You're too genuinely beautiful. Beautiful post, and excellent photos ! Hummingbirds always bring me joy ! What gorgeous photos! Beautiful. Thanks so much for sharing. I hope you have a great weekend! wow...great photos...and how true that sorrow and joy so often sit side by side. great post! thanks for swinging by my blog too!! hope you have a great day! *sigh* You really have a way with words. Aw, what cute pictures! I hope you have a great weekend!! Great post and great photos!!! Yay...did a little jig too when it moved!! You are so self-controlled. I'm tellin' ya, I probably would've tried to do CPR on the poor thing! How would we ever appreciate, or even know what true health was, if we never endured illness. I feel like it's the same with joy. Would we even KNOW true joy if we didn't ever have to endure pain and sorrow? Life is always like that isn't it. The sorrow with the joyous. Do you think it still might hatch? Yay for the Birdie!! 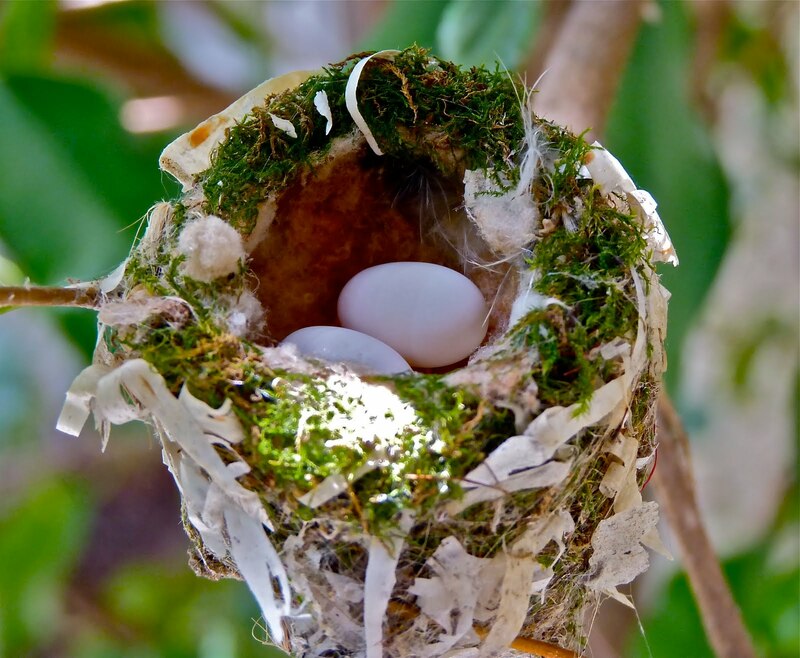 I love this time of year and being able to peek into birds nests. Although I learned my lesson one year when a Mama Robin caught me and tried to dive bomb me! Doing a jig along with you! Thank you so much for sharing these precious, tremendous photos! That really does just some it all up, doesn't it? Nature ROCKS!!! ah so beautiful. I love the pictures & i love birds. Only one word comes to mind: wonderful. Woohoo! If we all have a 50/50 chance in life then life will be good. Can I have the nest when they[re gone??? Pretty pleeeze? Amazing photos! Thanks so much for sharing them. And hooray that the hatchling's moving! Absolutely lovely story. Great pictures. What a gem. AHHHHH, I almost missed it. I don't know how. I love this nest. I love the little hatchling! What should we name it!! I hope he/she makes it! 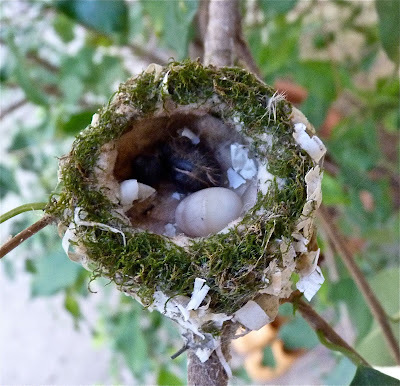 There's nothing I love than hummingbirds.... Other than BABY HUMMINGBIRDS! Great pictures! What a great way to put it, good and bad ARE side by side. We must embrace them both.......love the pics! Did you ever see it fly away? Now that's a great analogy.Spring does tend to make you feel philosophical, doesn't it?